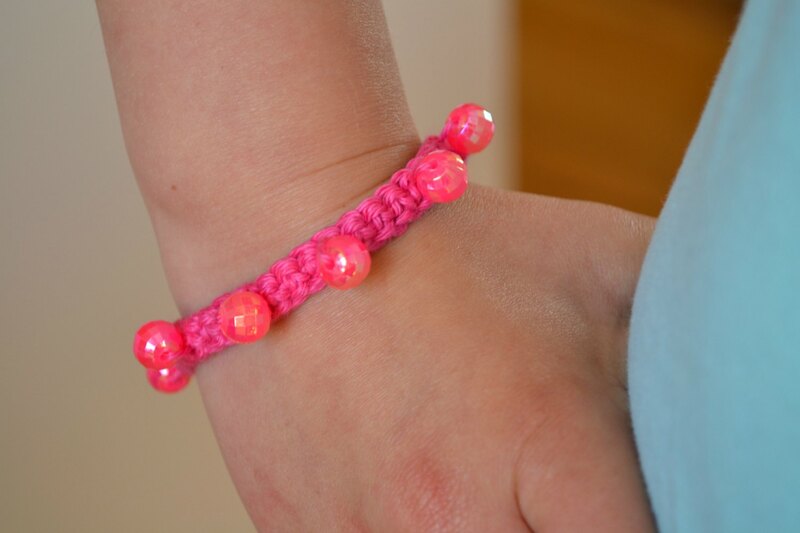 Here’s a little tutorial to make a simple beaded crochet bracelet or anklet. 10-15 small beads (how many you use is dependant on how closely you attach them and how long you bracelet or anklet is. 1. First up you will need to thread your beads onto the cotton. 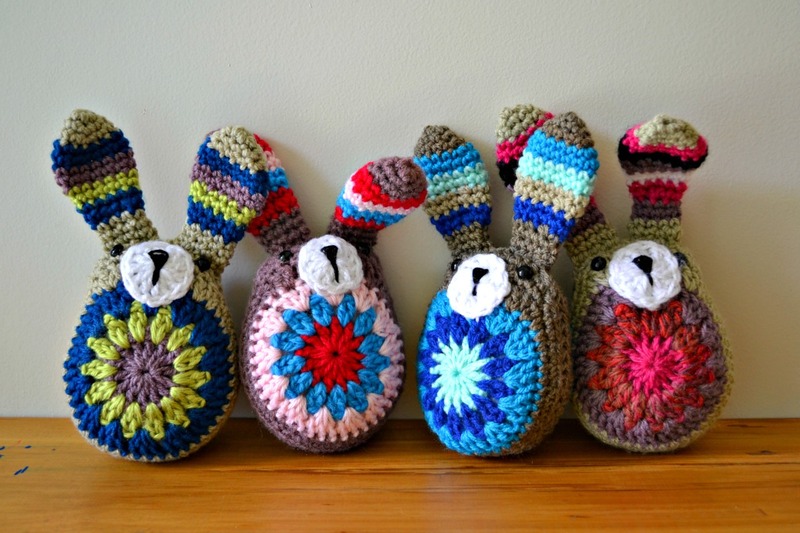 Just remember you can’t add beads once you start crocheting, so make sure you add more than enough now. 2. 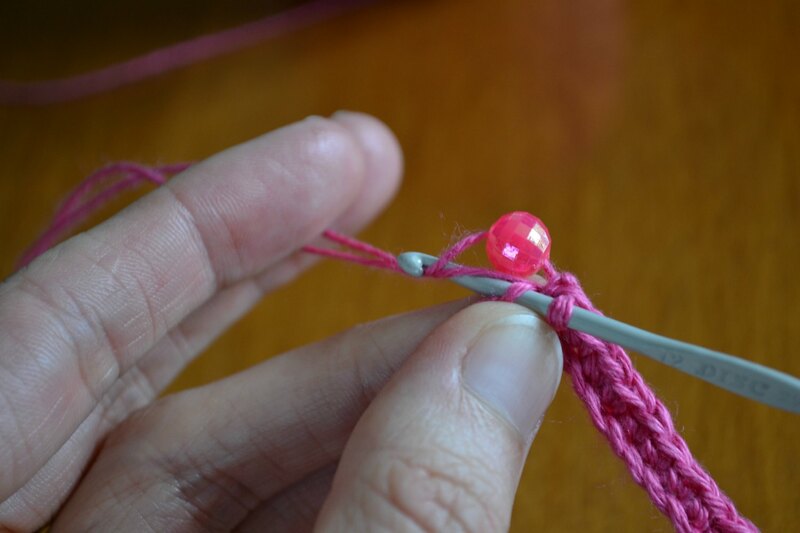 Next double the cotton over and tie off a knot to leave a small loop in the centre of your length. This loop is your fastening loop for joining to the other end of your finished bracelet. 3. 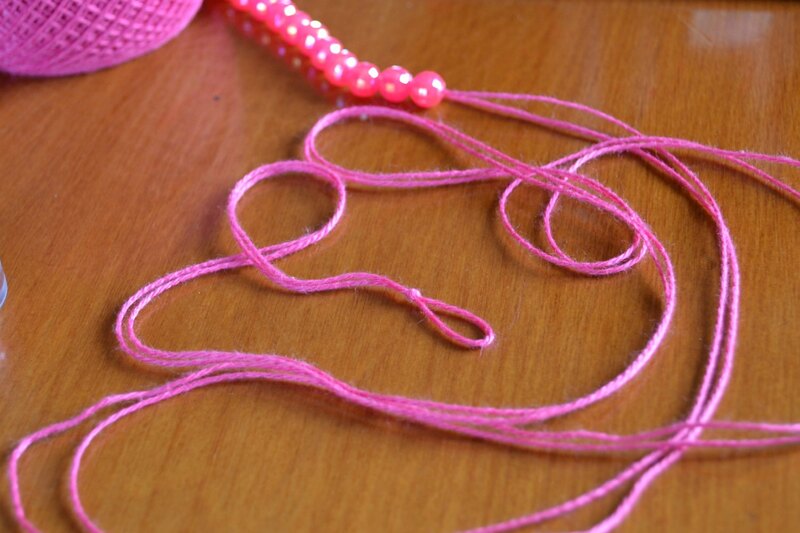 Insert your hook through the loop you just made and pull up a loop (both threads) and begin to crochet your chain. You need to chain the length you want your bracelet to be. 4. 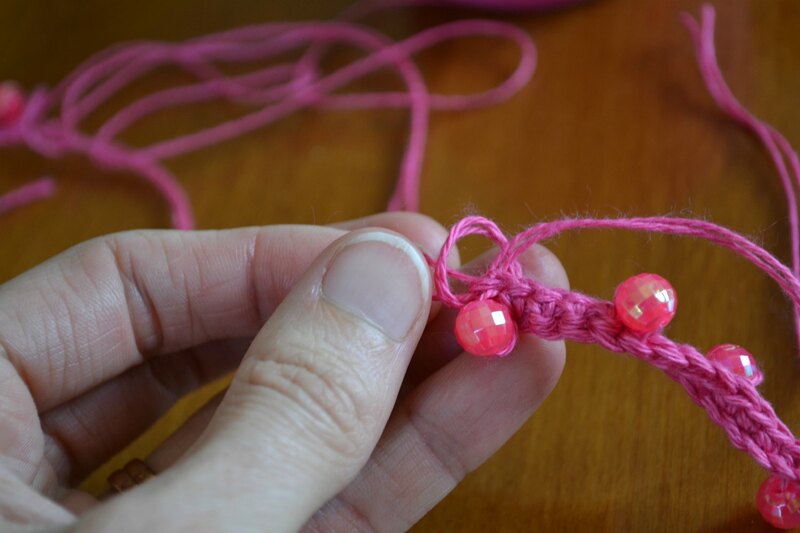 Pull the first bead up to the end if the chain and, holding it tight, make a single crochet over the bead in the second chain back from the hook. 5. 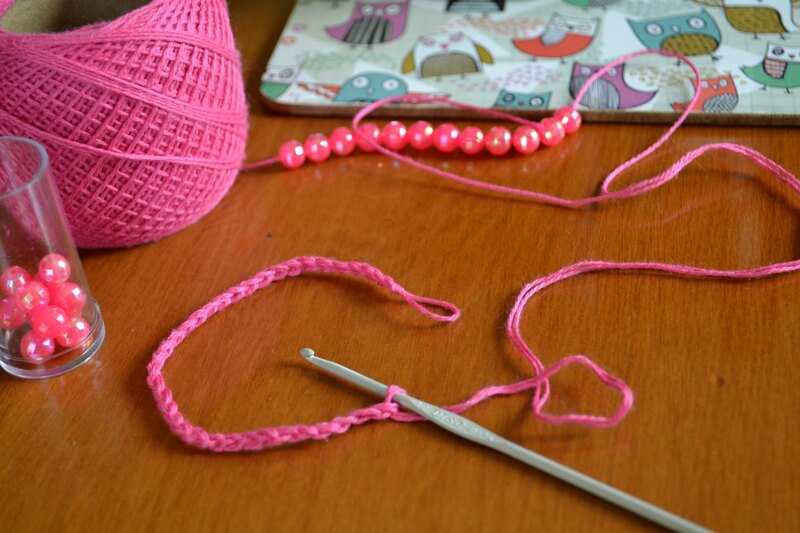 Single crochet in the next 3 spaces, pull up another bead and single crochet over the bead again. 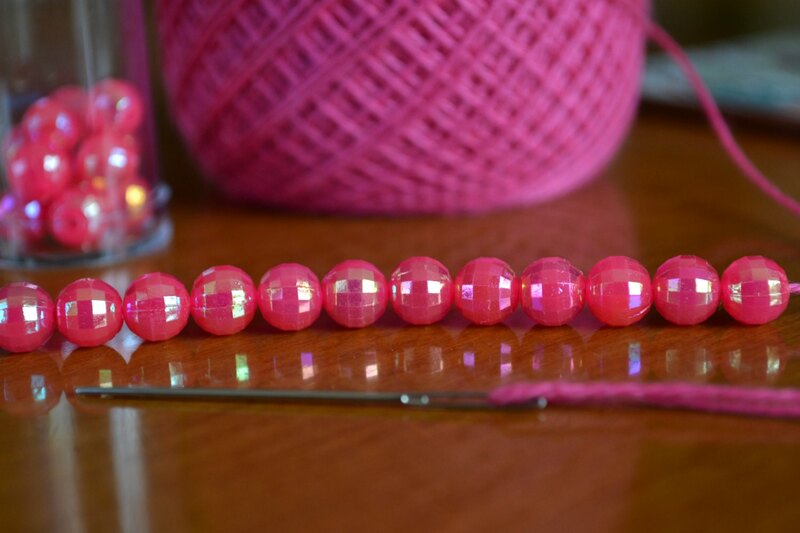 Repeat this for the length of your bracelet – leaving an even number of stitches between each bead (i.e. we’ve added the bead and then worked 3 single crochet before adding another bead, so that’s the pattern we want to stick to. Of course you could choose to leave more or less spaces between each bead to alter the look of the bracelet, just keep it even). 6. 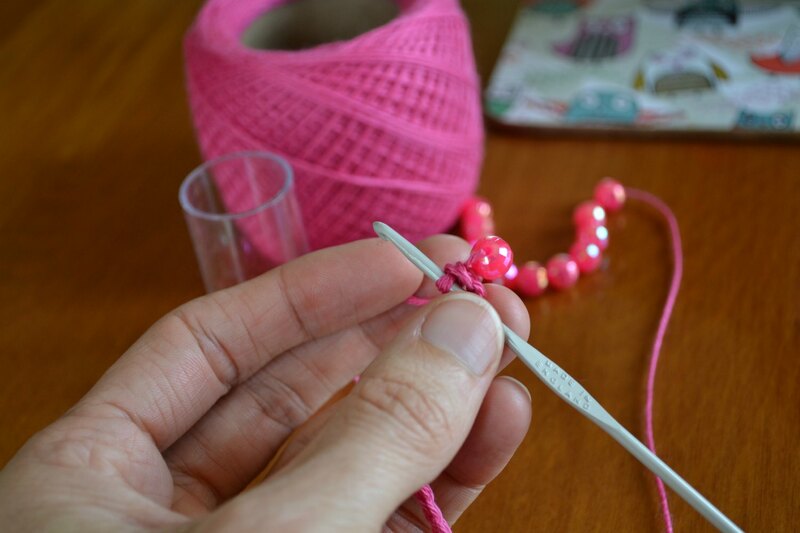 Add your last bead and single crochet in the last stitch, pull through the end and then wrap the yarn around, knot and fasten off just below the loop. 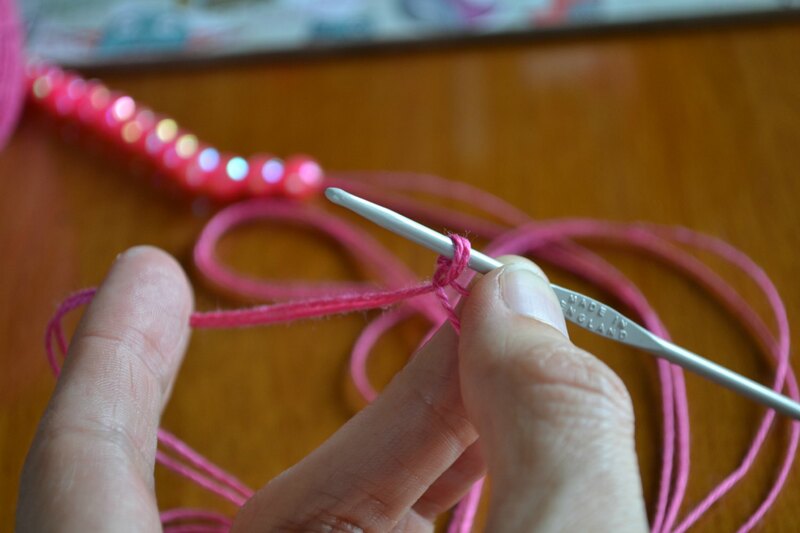 Sew you end back into the bracelet securely. I haven’t done any beading and this looks like a really good way to start. Thanks for the tutorial. Also I can see your wonderful pattern being used as the top edge of a little knitting bag. That is what I would like to try it for. 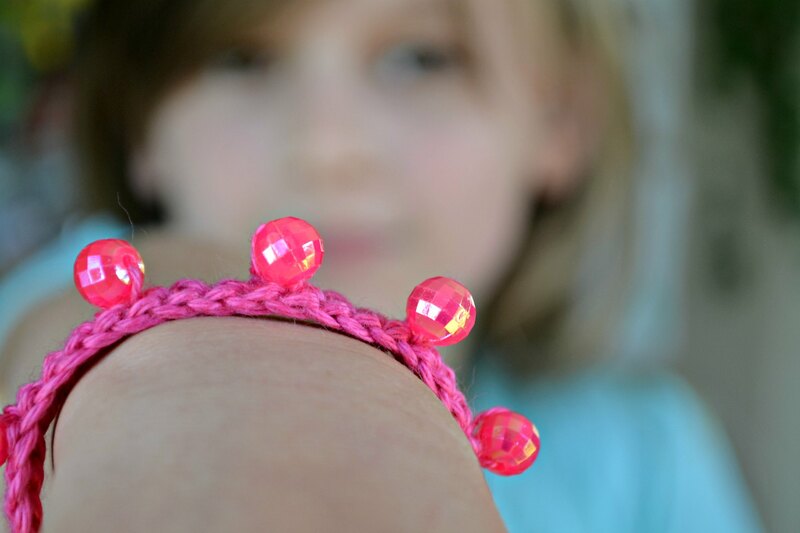 I just added this easy tutorial to my list of things I can inexpensively make for the little girls for Christmas. Wonderful idea, I’m sure they will love them! I’m sure they will too, thank you this was perfect timing. It looks realy good will give it a go…. This is so clever! 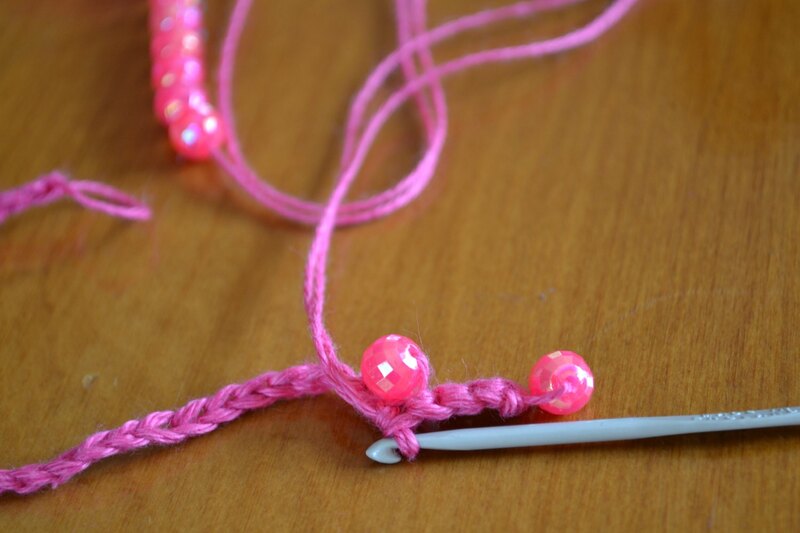 I’ve been wanting to make a friendship bracelet! 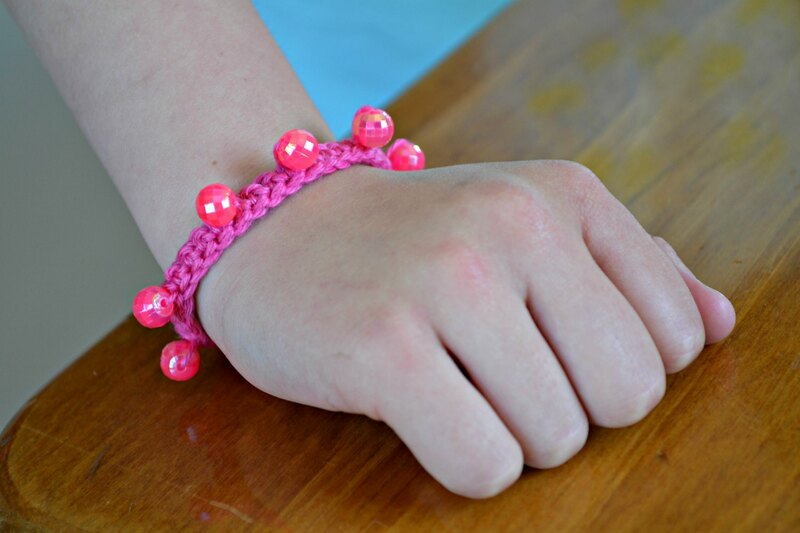 I love the beads, but I want to make a friendship bracelet for a boy, so not sure what I can do instead. I feel like just a chain stitch would be too plain. Hm… must think about it. But thank you for the tutorial! Oh thank you for the idea. Just made two for my daughters. For one of the bracelets I’ve used 4ply cotton(2 strands) and a 4mm hook. 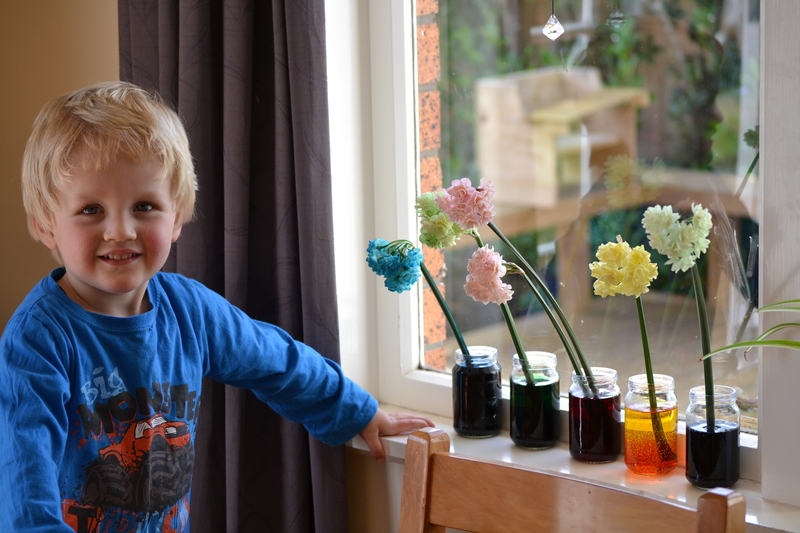 Love the result! So simple but lovely 🙂 thanks for sharing how easy it is to do this!